Convert your Plate Sprocket or just about anything from Pilot bore in to Taper Bore using our simple Weld-On Hubs. 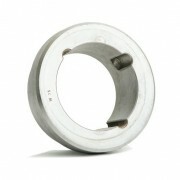 Weld on hubs are available to suit most taper bushes. These are commonly used on conveyor drums. They may also be welded to plate sprockets to make taper bored sprockets in our own factory.